The Balkans peninsula is a breathtaking landscape of endless mountains, and some of the highest and most rugged of them are situated in the far south of it. The Pindos moutain range in Greece stretches all the way from the Peloponese into Albania to the north, reaching altitudes of more than 2600 m. Albania is also a mountainous country, featuring several parallel high ridges stretching south to north in the southern part of the county, and a more complex structure of high, alpine type mountains in the north. Macedonia is a small country, but a country with some of the biggest mountains in the Balkans, and the place where you can reach the highest altitude on 4 wheels – 2600 m at the Pelister peak. Serbian mountains are somewhat lower (topping at Midžor with 2170 m), but not less attractive, featuring a sheer variety of landscape, offering not only endless highland ridges, but rich, dense forests too. 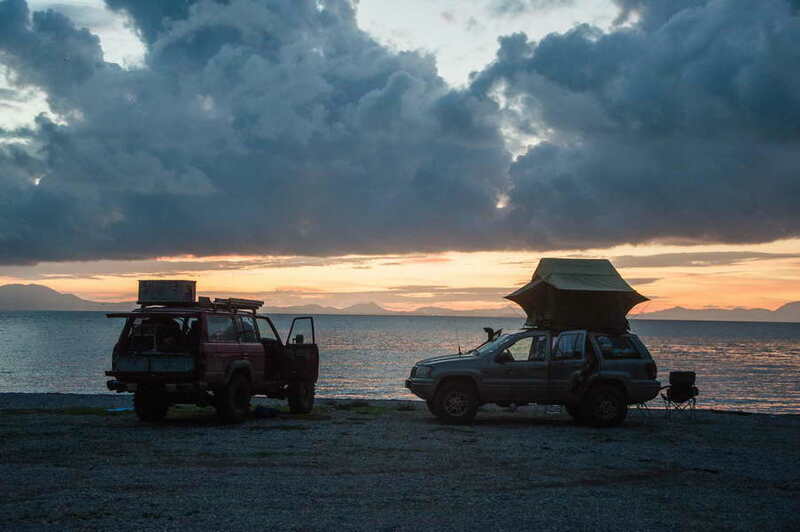 So it’s no wonder that an overlanding (4×4) tour including all these landscapes is one of the most exciting ways for an adventurer to spend his time in Europe. The two week itinerary for the main part of the tour starting at the Igoumenitsa port was a well known and tested track for us, but Mario and I gathered in Ioannina on October 20th, three days before the official tour start, to roam around the Pindos mountains for a few days and make a tour plan for next year. We’ve carefully prepared the material based on our previous explorations and the info that we gathered before this journey, but the Pindos mountains simply don’t stop to amaze us. A breathtaking, rugged scenery of high mountains, scarred with deep valleys and canyons, with glacier lakes everywhere and ancient pine forests, they’re an awe inspiring site. 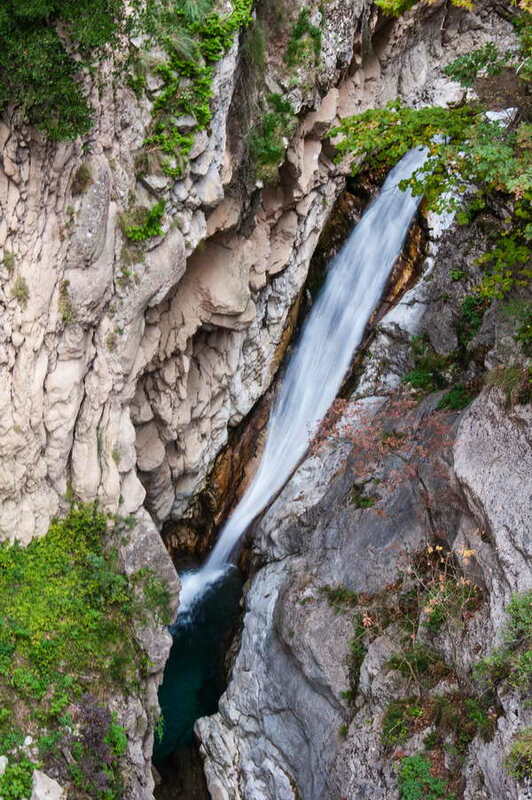 We are big fans of the Romanian Carpathians, but when you enter the magical world of the Pindos mountains you have an unmistakable feeling that the standards for wild beauty have just been raised to some previously unknown, new levels. In the Pindos mountains, you’ll find paved roads almost everywhere, they often get very close to 2000 m in height, so for a 4×4 explorer it can be kind of frustrating to sharing the road with regular passanger cars. But if you seek you will find desolate ridges where rocky, and at moments technically challenging offroad trails reach high above 2000 m, giving you a feeling that you’re headed towards a meeting place with the gods from ancient Greek mythology. What made us especially happy this time was the discovery of some high mountain passes over very rocky ridges, that link valleys that we thought had connections only available to hikers and mountain bikers. And that is certainly the most precious kind of a discovery in the scouting life of a 4×4 explorer – when you don’t have to descend back the same way you arrived, but the mountain opens it’s secrets to you and lets you through to new, uncharted territory. However much these three days that we’ve had available were short to get everywhere we planned, they were a great time to enjoy the kind of solitude that only such high mountains can grant you. Although late October was the very end of the herding season in the highland pastures, we’ve still seen lots of cows and sheep throughout the mountains, and the days (including the evenings) were warm, sending us a message that we’ve come south enough extend the summer at least for another month. Yes, these mountains will definitely be a fitting replacement for the final part of the tour, which we conducted in Serbia in previous seasons. And it will definitely be a fantastic one! We’ve spent the last evening before the group members arrived camping on a beach on the Ionean sea near Igoumenitsa – using a rare opportunity to sleep on a beach, which is now forbidden almost everywhere throughout the Meditterranean. 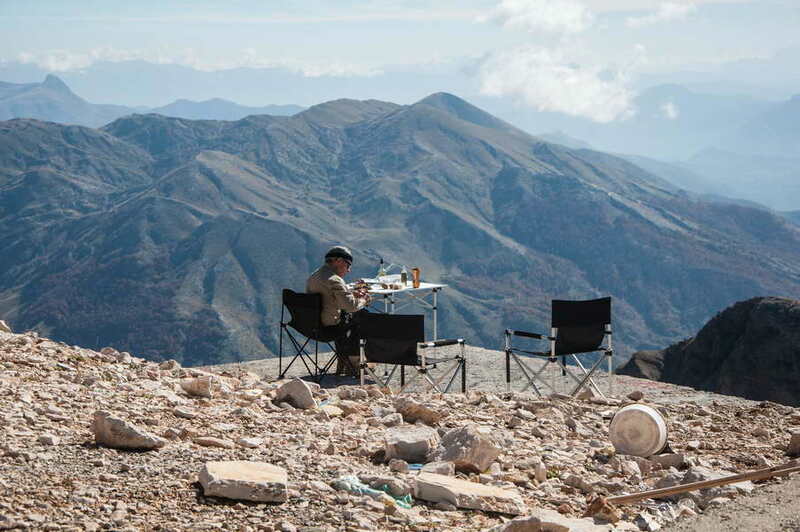 But Greece is still an oasis of freedom compared to some other countries when wild camping and exploring is concerned, no matter of being in the EU. We’ve packed up timely and moved over to the port of Igoumenitsa to wait for our tour participants arriving on the ferry from Ancona. It lasted a bit longer since they weren’t all on the same ferry, but eventually some time close to noon we were almost complete (two vehicles were still missing, and would join us in the following days), so we filled up and headed towards the border pass to Albania, where we arrived in notime. Having planned only three days for Albania, we couldn’t afford to head into the desolate, dry and rocky mountains of south Albania right away, but rather had to expedite our movement north a bit. However, a few hours later we’ve hit the first dirt road and began dusting upwards. Our goal for the first day was to reach a campsite near the famous Osumi canyon. We’ve had two goals for the second day of the tour – to ascend the Albanian holy mountain of Tommori (where there’s a solid gravel road that reaches the altitude of almost 2400 m), and to pass along the riverbed of the Tomorrica river northwards. But first we stopped to see the really impressive Osumi canyon, making a short break by the river for a quick photoshoot and some waterplay. We’ve had another boring paved road section before we’ve commenced our long climb towards Tomorri mountain. And it definitely was long – ascending more than 2000 m of altitude in one go would definitely not be something for vehicles that have a problem with the engine cooling system – fortunately, only one vehicle in the group had minor issues with that. As we’ve ascended Tomorri the views started widening, until we reached our point at some 2380 m of altitude with a truly breathtaking vista, seeing distant landmarks that you don’t get a chance to see often. It was a perfect, sunny and warm day (18 degrees C at 2400 m in late October! ), and it was simply the perfect place to make a lunchbreak. A magnificent place for a lunchbreak, isn’t it? Mount Tomorri is a sacred place to both christians and muslims, and it was named after an old Illyrian god Baba Tomor. There is something resembling a chappel at the peak, that is used for the ritual sacrifices of animals. We were a bit puzzled seeing the symbols of both religions up there, but later examined the history of this place and find out about the universal dimension of it being sacred for any Albanian, either christian or muslim. In the ancient Greek times, mount Tomorri was known as mount Amyron. The descent from mount Tomorri was more or less routine, until we’ve reached the Tomorrica riverbed, where we planned to drive along the river for some 15 km towards the north. And that is really a unique kind of a 4×4 adventure. A mixture of pebbles (even some gigantic ones) and concealed mud that you can easily sink into if you’re not careful, this riverbed is almost a kilometre wide, and sometimes it’s not easy to decide whether it’s better to drive right through the flowing river, or over the rocky formations on it’s sides. But, in about an hour and a half, we successfully resolved this task, with no surprises or accidents. Reaching our next campsite was then a routine task. 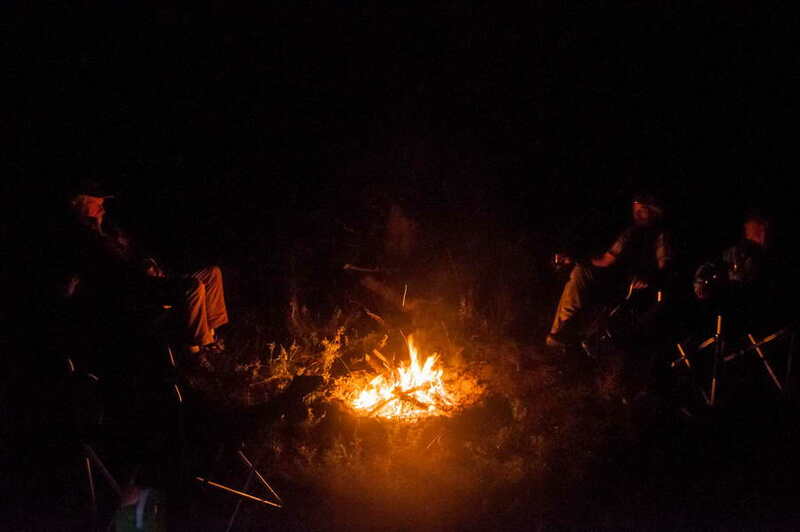 As it was a point where we had to wait for our first missing participant, there was no room to improvise and we soon put up the campsite in a wide river valley, with very little firewood available. It was already dark when our friend Yve arrived, joining us to continue the tour towards Macedonia on the next day. 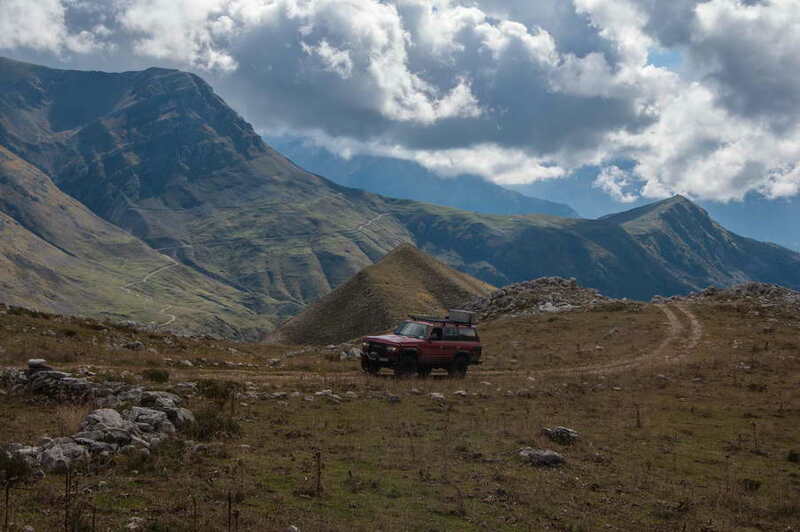 In Albania there are not many paved roads, especially in the mountainous areas. And when you see a road crossing a mountain depicted as a “main” road in the map, that doesn’t necessarily mean that this road is actually accessible to regular passanger cars. That was exactly the case with the eastwards road that we took on the next day to reach Macedonia. So that was indeed the most serious technical challenge in the Albanian part of the tour. Starting as a decent gravel road, as it climbs higher it becomes uneven, filled with rocks, deep ruts, and quite often with streams flowing down the road. So there were details on this road where you could well use all the clearance that you can get, and where the wheel articulation of our dominant solid axles really came in handy. We made the lunchbreak quite early, still on the nearer side of the mountain pass at an altitude of about 1600 m (the highest point was slightly above 1700 m), but as we crossed to the other side of the mountain the mentioned technical details quickly consumed all the time we’ve had. Then there was this up and down ride on the gravel roads that seemed to last forever, before wei’ve finally reached the Ohrid lake and our border crossing to Macedonia (FYROM). Just across the border there is this monastery Sveti Naum, now turned into a fine hotel, where we made a break from our camping routine. And a really delicious dinner in the restaurant nearby, as a farewell dinner to Mario (who later rejoined us again towards the end of the tour). Previous PostWhere are we taking you in 2017?Next PostOffroading in Romania – beginning of the end?